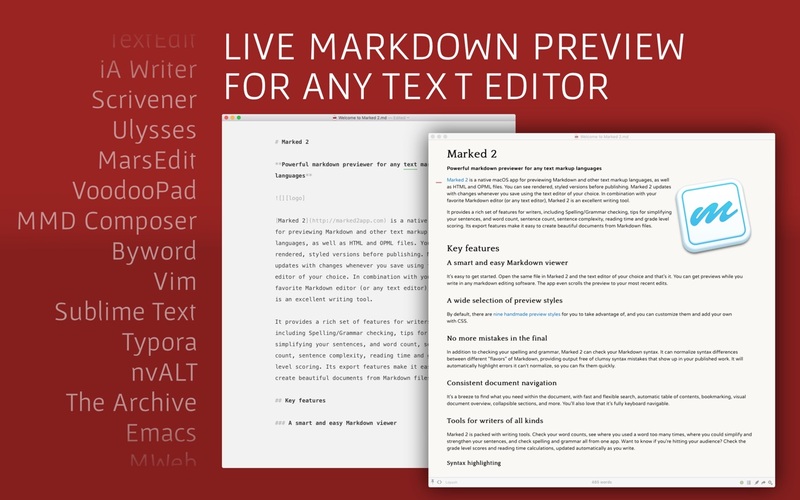 Marked allows you to preview your Markdown (in any flavor) as you write in your favorite text editor. It tracks your file changes and updates the preview as you go, even automatically scrolling to the point in the file where you’re currently working. Marked 2 includes a rewrite of the file-watching system for speed and accuracy. It speeds up just about every part of the app, making it even easier to get your work done without worrying about how it’s going to look or waiting for your preview to update. Next story iTubeDownloader 6.3.8.2 – Video downloader. Previous story DVDFab 10.2.1.3 – Complete solution for ripping and converting DVD and Blu-ray discs. Kardnote 1.0.5 – Note-taking with Markdown. Easy Markdown 1.4 – Create Web pages using markdown. NotePlan 1.6.29 – Task management with Markdown, calendar and notes.